Characterization of mechanically perturbed young stems: can it be used for wood quality screening? Genetic testing is the slowest part of a breeding cycle. There is a growing interest in early wood quality screening methodologies. 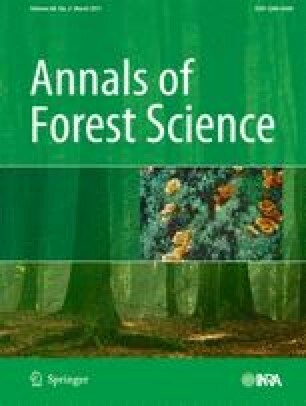 We hypothesized that subjecting 8-month-old radiata pine trees to mechanical perturbance induces reaction wood that permits isolating their likely corewood features. Four clones were grown straight, tied at 45° from the vertical, or rocked on a purpose-built frame. Trees were assessed for growth, basic density, compression wood, number of resin canals, and three acoustic stiffness (MoE) measures with an ultrasonic timer. There were no significant differences between stem postures for growth. Both rocked and straight trees developed similar levels of compression wood (between 13% and 17%). Rocked trees had a significantly larger number of resin canals than straight trees. Rocked trees produced the lowest MoE for all acoustic assessments. Clonal rankings for MoE were consistent between standing tree and green stemwood MoE. There were small ranking differences for dry stemwood MoE. Clone F, which expresses low MoE as an adult tree, had consistently the lowest MoE assessments but also the highest basic density. The observed differences in wood properties between clones make feasible their use for screening purposes at an early age. The authors thank Nigel Pink, Lachland Kirk, and Michael Weavers (University of Canterbury) for the design and construction of the rocking machine. This project was funded with contributions from FRST Compromised Wood (P2080) Programme and the New Zealand Wood Quality Initiative. We also thank the associate editor and anonymous referees for comments that contributed to improve the quality of the paper. R Development Core Team (2009) R: A language and environment for statistical computing. R Foundation for Statistical Computing, Vienna, Austria. ISBN 3-900051-07-0, URL http://www.R-project.org.